Stainless steel is extremely versatile and is selected for its use primarily due to its corrosion and heat resistant properties. This makes it the ideal material for springs operating in low maintenance environments or where replacement is difficult. 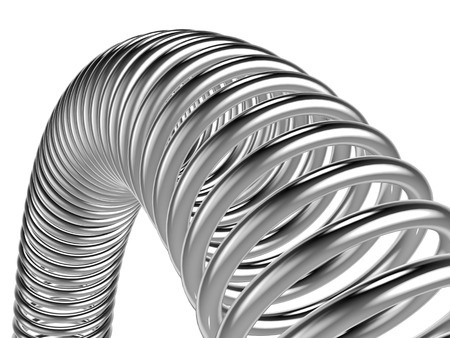 All BS Stainless spring wires are manufactured to the highest quality to achieve consistent spring forming capabilities. The precision cold drawing production of the wire ensures a high tensile strength with excellent cast and helix charac­te­ristics, and high elasticity and fatigue resistance. We offer an increasing stock range of spring wire in various sizes and all our spring wire is manufactured to EN10270-3 specifi­cation. To ensure maximum performance and efficiency when machining, our spring wire is supplied with a consistent soap coating that enables the spring forming machines to run efficiently at high speeds with excellent spring coiling charac­te­ristics. For smaller diameters between 0.20mm and 1.60mm, a nickel-coated wire can be supplied which offers a special coating specifically designed for fine wires. For certain applications where no soap coating is required we also offer a bright finish.